When it comes time to design the kitchen or bathroom of your dreams, you will want to know which style or design first you and your home best. To help you understand some of your options, we’ve created here a quick list of styles that often inform how we design our custom-built kitchen and bathroom cabinets. While this list isn’t the be-all-end-all list of furniture design options, it is enough to get you started. Victorian: Cabinets made in the Victorian style are ornate, dark and elaborate. They have intricate carvings and ornamentations. This style lends itself well for formal settings. Traditional: Traditionalists enjoy dark cabinets with decorative trim and curved lines. These pieces often take on the look of actual furniture, such as dressers with legs. Arts & crafts: This style is more about function than form, as it emphasizes simple and streamlined construction. You’ll most often find medium and dark woods and stains used for these custom cabinets. Designers who are true to this style are also true to using local resources to complete each project. Country: These cabinets embrace old-world charm and traditional furniture pieces. Wood type depends on whether you are looking for a more Americana feel, which is lighter woods and white, or an Old English feel, which includes darker, ornamental wood cabinets. Rustic: Fans of this style truly appreciate the knotty, natural look of raw wood. Cabinets are dark and distressed. Overall, the rustic style provides a warmth and comfort level that everyone can enjoy. Shabby chic: This is a newer style first coined in the 1980s. It combines the appeal and comfort of country styling with vintage accessories. You’ll most often find custom-made shabby chic cabinets painted white. Mid-century modern: This style came about in the 1950s, with a heavy Scandinavian influence. You’ll find simple styles with straight lines and a reliance on glass for accents. Woods are often of medium darkness. Contemporary: Custom bathroom cabinets and kitchen cabinets that follow the contemporary style accentuate clean lines and basic shapes. These cabinets incorporate lighter colors, such as light wood types and white paint. These rooms also add in pops of bright colors and art pieces to round out the style. Ultramodern: Homes that follow this style emphasize minimalistic design. You have just what you need, at lower heights and in brighter, lighter colors. Many of these designs also incorporate green design, or natural materials and energy-efficient lighting and other accessories. If you’re just not sure about any of these, or perhaps you want a little of all of it, you may find that your style is more eclectic. Eclectic furniture design incorporates elements of several styles to create a truly one-of-a-kind room. Whatever your style is, we can match it. 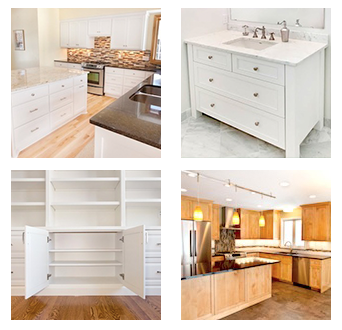 Turn to us for help designing cabinets to match your tastes. You can reach us at 952-737-7088 or you can request a consultation online to learn more.